At 69, Shirley not only is The Sanctuary’s oldest elephant, but one of the oldest living elephants in North America. The Sanctuary is honored to provide state-of-the-art veterinary care for Shirley as she enters her 19th year with us and are looking forward to celebrating her 70th birthday. 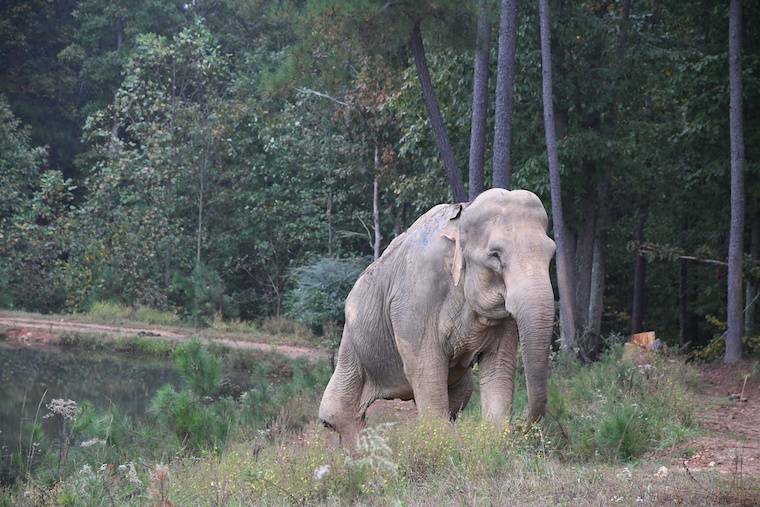 Asian elephant Shirley has a remarkable life story. She survived a ship fire, an overturned transport trailer, and a broken back leg. Shirley retired to The Elephant Sanctuary in 1999 after spending 24 years in the circus and another 22 years as the sole elephant on exhibition. 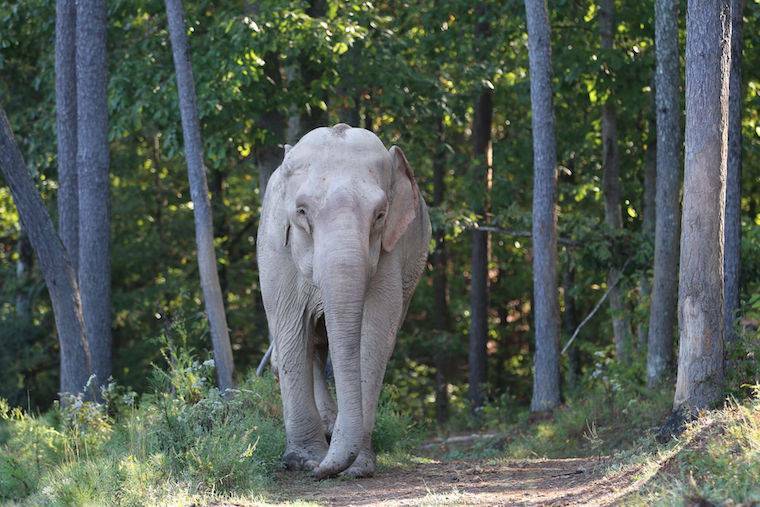 Now 69, Shirley continues to shine at The Elephant Sanctuary. Individualized care from a professional team of Veterinarians and Caregivers has allowed Shirley to age gracefully in a natural habitat setting and make choices about her daily life. As we observe changes in Shirley as she ages, we recognize greater susceptibility to many of the issues that face aging captive elephants—and a longer healing process when age-related health issues do arise. Years of traveling and standing on hard surfaces contribute to arthritis and chronic foot issues in captive elephants. Though she still enjoys long-distance explorations, at 69, Shirley’s pace has begun to slow. Much like at an assisted living facility, at The Sanctuary, comfort, choice, and independence are tantamount to quality of life. At The Sanctuary, aging elephants receive daily individual veterinary and husbandry care from a professional team of Veterinarians and Caregivers to meet their needs in the aging process. Put simply, Shirley receives gold-standard elder care. Always innovative, The Sanctuary’s Veterinary and Caregiver teams have custom-designed a treatment of antimicrobial sponges and soft, flexible epoxy to protect Shirley’s feet, promote healing, and increase her overall comfort. Care Staff refer to these patches as Shirley’s insoles. With this treatment, Shirley has shown greater mobility, allowing her the freedom to comfortably explore her habitat. In addition to foot treatments, Shirley’s individual care plan includes daily arthritis supplements, anti-inflammatory medications, and multi-wavelength cold laser therapy to reduce discomfort associated with arthritis and other joint conditions. Sunscreen and botanica cream are applied regularly help prevent and treat sunburn that has begun to affect Shirley more as her skin thins with age. Caregivers regularly collect imaging of bones, joints and teeth to monitor and diagnose issues. As all Shirley followers know, Shirley’s right hind leg was broken during her time with the circus, more than 40 years ago. As it healed, several bones in her leg fused together, creating an abnormal angle and shape. Shirley has a sequestrum associated with the old fracture, which means she has pieces of devitalized bone under the skin that cause periodic sores that lead to localized drainage. Laser therapy, hydrotherapy and treating her for pain, swelling, and infection are all ways our veterinarians effectively manage symptoms and maintain Shirley’s health. Caregivers have also noted that Shirley’s eyesight has begun to diminish in dim lighting as she’s aged. To maintain eye health, fresh, leafy vegetables high in antioxidants have been incorporated in her daily diet (which also includes prunes for regularity) and Caregivers have begun to leave the lights on in the barn at night. Nightlights haven’t stopped Shirley from getting the rest she needs. Sand piles have been added throughout her habitat and in her barn stall, which have allowed Shirley to comfortably and easily lie down to rest and sleep. Caregivers said the sand pile in Shirley’s habitat must be fluffed regularly because she uses it so much. Before adding the sand pile to the barn, Shirley had never been observed lying down inside. She now uses the special sand pile almost every night, sleeping for six to eight hours. The Sanctuary’s Veterinary and Care Staff also monitor Shirley closely due to her known TB exposure from her history as a traveling, performing elephant and her closeness to Jenny. Prior to retiring to The Sanctuary, Jenny spent time with the Hawthorn elephants at their corporate facility between 1992-1993. In 1996, it was reported that Asian elephants Joyce and Hattie—both owned by the Hawthorn Corporation—passed away while traveling with the circus. TB was discovered to be the cause. Subsequent testing revealed that TB exposure was widespread in the Hawthorn herd. This wave of diagnoses marked the first time during the modern era that TB was detected in captive elephants in North America. 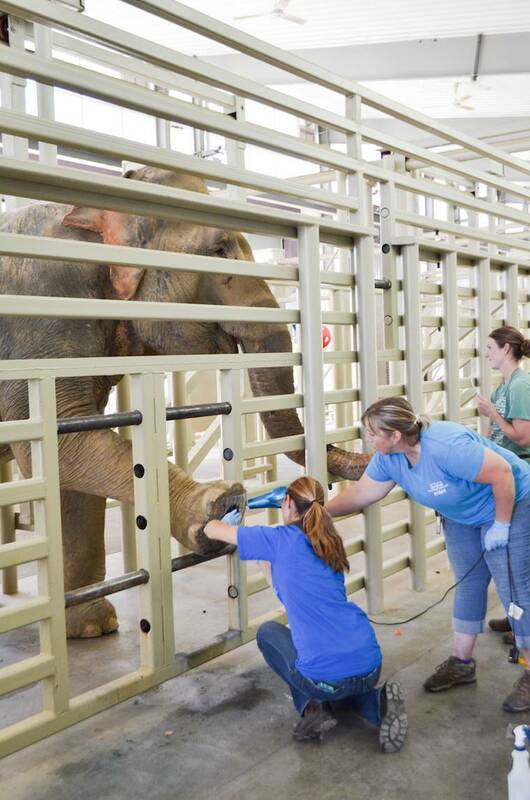 TB continues to affect elephants in captivity prevalently throughout North America. Though there is still a lot that is not known about TB and elephants, TB is known to be an opportunistic disease that can be latent for many years.